Miso: fermented soybean paste for soups, flavoring and as preservative agent. Su: rice vinegar, a natural inhibitor against spoilage. Mirin: sweet rice wine for seasoning, as sugar substitute, as a food tenderizer; used to add luster. Sake: rice alcohol is used sparingly during cooking. Rice is to the Japanese, what bead is to the Americans or what spaghetti is to the Italians – it is the single most important ingredient in Japanese cooking. Rice gives foundation to the other pillars of Japanese food – from rice come Miso, Su and Sake,. Japanese rice is a short, glutinous grain, and after cooking it retain much of its moisture. Rice originated in Africa and was transported to American soil in the 1800’s along with the plantation workers of the South. This variety was a low starch, long grain variety that flourished along the delta regions of the Mississippi and in Arkansas. Much later in the 1950’s, the Calrose medium grain Japanese rice was developed by a UC Davis biochemist. Calrose is the glutinous medium grain with moisture retaining qualities, however once cooled, turns brittle in the core. In 1964, Koda Farms in San Joaquim Valley succeeded in cultivating a more glutinous grain with less deterioration which remained tender after cooling. Their Koda Kokuho rice did what Calrose could not; retain its elasticity even after cooling. A few years later , New Rose Rice debuted as the “Sushi Rice” and is currently the preferred choice by many sushi chefs. Miso is a fermented soybean paste used in making the ubiquitous Miso soup served at most Japanese restaurants. It is a popular flavoring base, giving character to sauces, marinades and dressings, as well as the “comfort flavor” qualities of home cooking. Regions of Japan produce different types to suit their regional taste, varying from dark to light, from salty to sweet, depending on the aging period and rice to soybean ingredient ratios. There are basically two types: the sweeter white and the richer red. Early Miso production in the United States were small plants operating to supply local communities. Today, Miyako Oriental Foods in Baldwin, California is the largest in the US, producing Shinshu-style Miso under the Yamajirushi, Yamaizumi, Kanemasa and Cold Mountain brands. Only organic soybeans are used. Shoyu is the dark colored soy sauce, which appears on the tabletops of every Japanese restaurant, just as a bottle of ketchup would at an American diner. Japanese soy sauce is a brewed concoction using soybeans, wheat and salt. So versatile – straight as a dipping sauce for Sushi, mixed whth other ingredients to create other sauces, flavoring during cooking – its use is endless. Shoyu brewing is an art, with each manufacturer armed with its own secret recipe. Japanese Shoyu is naturally brewed – soy sauce made elsewhere in Asia serve as poor substitutes. The better the soy sauce, the better the food will taste. In Japan, Yamasa Soy Sauce is the brand of choice by most professional chefs, with a 350+ year tradition for producing fine, gourmet Shoyu. Yamasa started US production of their Shoyu at their Oregon plant in 1994. Recently it earned recognition among trade circles by winning the gold medal award from the American Tasting Institute. Kome Su, or rice vinegar is another ingredient Japanese food cannot do without. High quality Su uses rice as the main ingredient, where its natural brew yields mellow vinegar with rounded flavor that is perfect for Sushi. Using inexpensive ingredients such as corn and wheat lowers the quality. These cheaper vinegars are often used for pickling vegetables and fish. Rice vinegar also has potent antibacterial and preservative qualities – laboratory tests have shown its effective use to control E coli and Salmonella. Perhaps this is the reason for the low rate of bacterial food poisoning from Sushi in Japan. Nakano Vinegar’s Mitsukan brand is popular in the Kansai area in western Japan. Yokoi is the brand of choice in areas to the east surrounding the Kanto area including Tokyo. Sake has been brewed in Japan since the 3rd century, and holds traditional and religious significance in celebrations and festivals. Its venerable beginnings, once available only for consumption by the Imperial court, later opened up to Buddhist temples as brewing spread throughout the country. Originally, Sake was a cloudy brew, as filtration technology was not yet available back during the days of the Samurais. Sake is made of specially grown Sake rice and water, and brewed with the introduction of special koji. Through the use of this koji, Sake can reach a natural alcohol content nearing 20%. Basically, there are three categories of Sake: cooking Sake, drinking Sake, and the premium Jizake. Cooking Sake is used much like cooking wine with western food. Most standard drinking Sake are mass produced, good tasting but lacking in distinctive flavor personalities. Jizake is the new wave of micro-brewed, regional Sake which express more character than the mass manufactured varieties. Often, they have limited distribution and the super rare are found only ant expensive foodservice restaurants. The first US Sake brewer was Honolulu Sake Brewing and Ice Company in Hawaii, which in 1908, brewed Sake and Mirin under Takara Masamune and Takara Musume brands. Today, these labels belong to Takara Sake USA in Berkeley, California. With their flagship Shochikubai brand, Takara is currently the largest Sake brewery in America. Cooking Sake is a rice wine, while MIRIN is the sweet version, used specifically in food preparation to enhance flavors, textures and finish. Rather than plain rice, Mirin used sweet rice as the main ingredient, brewed to become syrup-like sweet sake. 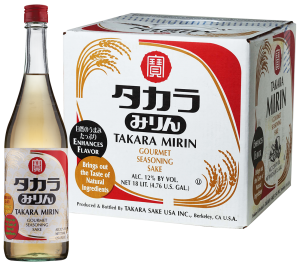 Mirin and cooking Sake both have multiple food applications, from meats to fish and vegetables, as well as from traditional Japanese to borderless cuisine.